Dmatel Hotel and Resort PH is an elegant and well-designed 4-Star hotel located at 91, Stadium Road, Rumuomasi, Port Harcourt, Rivers State. It is a top destination for comfort seekers. 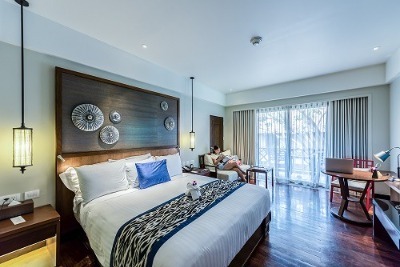 All rooms in Dmatel Hotel and Resort PH are fully air-conditioned and exquisitely furnished with a king-sized bed, intercom, ensuite bathroom, flat-screen TV with satellite connection, cushion, refrigerator, wardrobe and bedside drawers. The rooms available are categorised into: Deluxe, Standard, Executive, Superior, Royal and Suite. These rooms are booked at different costs. However, continental breakfast is served daily while room service is available round-the-clock. The onsite restaurant serves a variety of local and continental dishes in menu options. Alcoholic and soft drinks are served at the onsite bar. The outdoor pool is appropriate for guests to enjoy a relaxing dip and guests can enjoy workout session at the fully equipped fitness centre. The banquet hall is appropriate for corporate/social gathering. Laundry, concierge, daily newspaper and car hire are available on request. Onsite parking space is ample, and security is guaranteed. Free internet is available on the premises. Dmatel Hotel and Resort PH is a budget hotel in Port Harcourt, Rivers. My stay was amazing. I felt so at home. The comfort, the bathtub, the bed, the power supply and everything else was perfect. I got more than I bargained for and I am definitely looking forward to visiting again soon. My stay was so fantastic. I arrived at the hotel very late at night, and I was allowed to check in because I already made my reservation online. The receptionist was very professional, the meal was perfect and my room was well furnished and comfortable. I will certainly lounge at the hotel whenever I visit Port Harcourt. My arrival at the hotel was greeted with a friendly welcome by the receptionist. The environment is serene and clean. I enjoyed the free Internet connection with impeccable power supply. The hotel is amazing! I really had a nice time at the hotel, the receptionist was very friendly. I got value for money because every single thing was properly handled by very capable hotel attendants. There was constant power and water supply, the room was neat and well arranged, room service was very prompt. It was indeed an awesome stay. I had a perfect, excellent stay at your hotel. I don’t have any reservations about recommending your hotel to others. I will score you a 9.5 over 10, you were that good. Just keep up the good work and maintain your impeccable standards. This is my opinion but I don’t know if anyone will differ. Have nice pictures of Dmatel Hotel and Resort PH?